Hors d'oeuvres and wine will be served. Must be 21+ for wine service. Free and open to the public. Limited seating. Orange County is the smallest county in southern California, yet it is the richest in public lands – we are home to over 55,000 acres of open space. Mountain slopes, rolling hills, coastal valleys, seaside terraces, and pristine beaches characterize the county. Yet it is no coincidence that Orange County sets aside so much land for public access. The natural and open spaces in Orange County such as Crystal Cove State Park, Irvine Ranch Open Space Preserve, the Laguna Greenbelt, and various regional parks make up a tapestry of land moved from private ownership, preserved by citizen groups, mandated by state and federal laws, and set aside as natural spaces for the protection of wildlife and the increased quality of life of its residents. Open spaces in Orange County are as much a part of our regional identity as are the partnerships that formed to protect them. Striking a Balance chronicles the story of how residents, private land owners, and state and local government have compromised, collaborated, and committed to the preservation and conservation of some of the most treasured greenbelts, parks, preserves, and beaches in the state – each one celebrated for its immense beauty and precious ecosystems. Using photographs, archival documents, and items from UCI Libraries’ Special Collections and Archives, the exhibit highlights Orange County’s natural communities while simultaneously documenting the push and pull between unlikely partners such as Laguna Greenbelt, Inc., Friends of Newport Bay, Crystal Cove Alliance, The Irvine Company, and the State of California who wrestled with the challenge of balancing growth and development with wildlife and wilderness protection. Striking a Balance is a tale of milestones and victories that set apart the growing metropolis of Orange County as a leader in the protection of our natural communities. The UCI Libraries Exhibits Program promotes the diverse holdings and scholarly and cultural value of the Libraries’ collections to the campus and community. • To support the Libraries' Collection Enhancement Fund, please go to: http://www.uadv.uci.edu/CollectionEnhancementFund. • To sponsor this exciting event please contact Wendi Morner, Director of Development, at wmorner@uci.edu or call 949.824.8904. 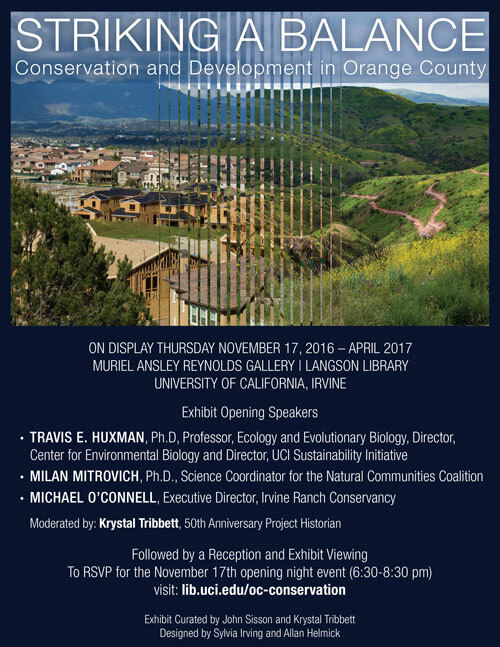 Striking a Balance: Conservation and Development in Orange County will be on display through April 2017 in the Langson Library Muriel Ansley Reynolds Gallery during regular library hours.